Newly emerging research supports the theory that brain health is intricately linked with digestive health, particularly in traumatic brain injury and concussion patients. Both the brain and the gut respond to inflammatory processes that lead to tissue damage and loss of function. These seemingly separate body systems may negatively interact with each other to encourage systemic infection and inflammation, resulting in long-term health deficits. Hyperbaric oxygen therapy (HBOT) reduces systemic inflammation by delivering high-dose oxygen to every cell in the body, encouraging cellular metabolism and immune function. HBOT can assist in the recovery from TBI and gut dysregulation. Researchers believe there is a strong, bidirectional relationship between the brain and the “gut” that may significantly impact the recovery process for the patient. Traumatic brain injury (TBI) and concussion, commonly referred to as mild traumatic brain injury (mTBI), are gaining attention in the world of public health and medical research. Leading researchers, including those at the University of Maryland School of Medicine, are attempting to identify critical molecular mechanisms at work during both the time of initial injury and throughout the stages of the recovery process. These research efforts have enriched the library of knowledge surrounding brain injury significantly within the past few years. An exciting novel approach to understanding brain injury includes examining neural interactions with other systems in the body, particularly the digestive system. It is well-established that the central nervous system – the brain and spinal cord – regulates the health and function of the gut. While it’s been known for years that TBI induces delayed, long-term changes in the colon, recent studies show that TBI causes structural and functional damage to the digestive tract by making the intestinal wall more permeable after the trauma. A healthy digestive tract works as a physical and chemical barrier to the external environment. TBI-induced permeability may allow harmful intestinal bacteria to migrate to other areas of the body, resulting in chronic inflammation and systemic infection. Scientists are working to elucidate the molecular basis for this phenomenon. With our increasing understanding of TBI and digestive health, researchers are solidifying the argument that 1) the central nervous system regulates the digestive system, 2) the digestive system may directly affect brain inflammation and tissue damage. 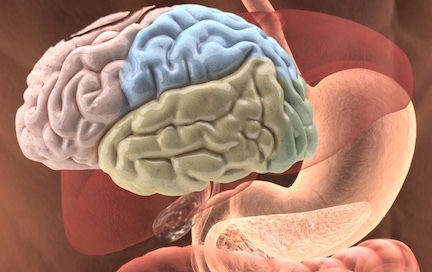 The health and functioning of both the brain and the gut are regulated by a series of neuropeptides, immune signaling molecules, hormones, and neurotransmitters. The composition of the strains of intestinal microbiota is also thought to play a role in this gut-brain relationship. One proposed mechanism of action for this circular inflammatory response is that both the gut and the brain are home to similar types of glial cells. Activation of these glial cells are known to contribute to delayed tissue damage in the brain, and scientists speculate this is most likely occurring in the gut as well. While TBI may initiate a vicious cycle of gut dysfunction, novel research suggests this gut dysfunction in turn worsens the original brain injury. Fortunately, the gut-brain axis is offers a potential target for HBOT and other therapeutic interventions after traumatic brain injury. While conducting research with military veterans and TBI recovery, researchers and clinicians have observed that patients experienced improvement of digestive problems as well. HBOT lowers systemic inflammation, increases immune response, and promotes optimal cellular functioning within the entire body. This whole-body approach may offer a powerful healing tool for TBI patients and decrease the risk of future neurological degenerative conditions.